What is Laser Metal Fusion? Laser metal fusion, also known as selective laser melting or powder bed fusion, is an additive manufacturing process. It is effectively a 3D printing technology that builds components from a powder bed by selectively melting the powder and fusing it, layer by layer, onto the underlying substrate. The component is constructed on a build plate or substrate plate. The build plate is coated with a metal powder within a containing cylinder under an inert atmosphere such as nitrogen or argon. A laser beam is then used to selectively melt the powder to create the desired cross-section of the component. Usually, high power fiber laser is used. The build plate and component are lowered within the containing cylinder, and another layer of metal powder is introduced. The laser beam is used to selectively melt the powder to form the next layer of the component. Layers are added in the same way until the part has been constructed. Typically, each layer is between 20 to 100 microns. The amount of powder added at each stage must be accurately controlled, and this is achieved using a sophisticated powder delivery system. One such arrangement is shown in the diagram. Components can be made through additive manufacturing processes. The completed work must be removed from the build plate and finished. Usually, the surface retains a granular appearance and must be polished. Normally this is carried out using a lower power laser beam that delivers sufficient energy to melt the surface peaks, a process known as “laser polishing”. 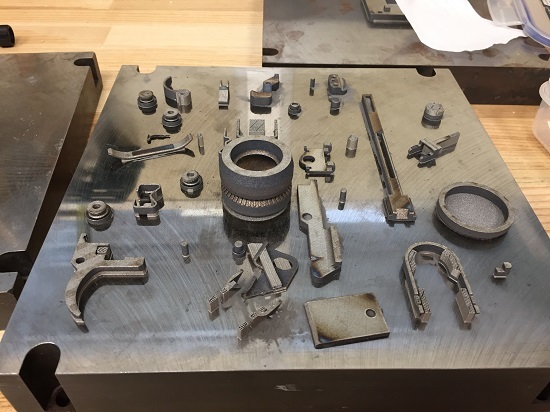 While it is possible to produce small components in hours, more substantial parts can take several weeks and usually it is vital to avoid interrupting the cycle. Due to the precision and small spot size of modern fiber lasers is is easy to build complex three-dimensional parts with very high accuracy. Such is the degree of control that what would have required several different components if manufactured by traditional methods can be integrated into a single component when made using laser fusion. It is now possible to produce parts that previously were impossible to fabricate using traditional methods. Laser metal fusion is a complex process with many variables that must be controlled. The nature of the powder, its composition, and grain size need to be carefully formulated and controlled. The properties of the built material are critically determined by the particle size, particle shape, particle size distribution and density of the powder bed. The quality of the fiber laser beam is also crucial, its power and spot size having a significant impact on the quality of the product. Reliability and stability are vital, especially in fabricating complex parts that take several weeks to process. Many bespoke components can be built simultaneously on a single build plate, each one different from the others. Primarily, if its possible to create such a mix of components in CAD, then they can be realised in a single build. Medical sector – the construction of bespoke hip joint implants. Although the process was initially devised towards the end of the twentieth century, it is still considered to be in its infancy as a manufacturing process, and new applications are emerging in several sectors. Laser metal fusion is providing designers with extra degrees of freedom for producing components that were once thought impossible to make. This exciting development is revolutionising many industrial sectors, and it is clear there are many new developments in the pipeline. To discover more about how fiber lasers are making a difference, please contact us, we are excited about meeting you.